Arsenal has agreed an £18m deal with Chelsea for the transfer of Olivier Giroud across London. Giroud traveled with the Gunners to the Liberty Stadium ahead of the game against Swansea, but the successful negotiation between the two London clubs meant the forward had to depart to complete the transfer. This deal will pave the way for Aubameyang to finally complete his move from Dortmund because Chelsea will be able to sanction Batshuayi transfer. Giroud and Chelsea had agreed on personal terms over 24hrs ago, but a fee dispute between Chelsea and Arsenal stalled negotiations and nearly threaten to scupper the deal, but a compromise of £18m seems to have done the magic. 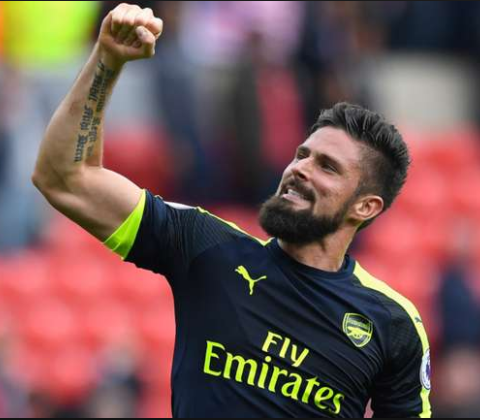 Giroud’s goal of the year 2017 shot him straight to the heart of fans, the love and fans appreciation became even evident when the news of his possible departure broke. Giroud scored 105 goals at Arsenal in all competition, and won 3 FA Cups, having hand in all the 3 finals.